So, I am taking 2 courses this semester: Psychology and Philosophy. Both of them are introductory level, and they are even located next door to one another, so I am becoming very familiar with the main floor of the IB. Psych is...well, introductory level psych. Lots of terms and definitions to memorize, a big class of which only half shows up because attendance is not mandatory, and a relatively new professor that cracks corny jokes. Philosophy on the other hand is run by a very "eccentric" man. You know that first class that isn't really a class because the professor just hands you a course outline and tells you what you'll be covering next week, so read up? Well, this guy ranted for 2 hours on cell phone use in the classroom, and how half of the class will fail because this course has the highest fail rate on campus...needless to say a few dropped out before the next class, and most of the class opted out of the (optional) term assignment, even though that meant the highest grade they can get is a B+...best case scenario. In spite of the fear and trepidation in my heart, I have chosen to work on the term assignment, which is basically constructing a logical and formulaic argument. How hard can that really be, right? Right?? 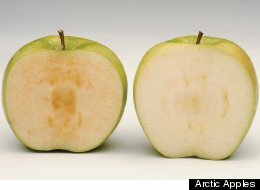 I thought I had an airtight topic: bringing down the introduction of a GMO apple to the Okanagan. I had read a couple articles about this which had me all riled up and it seemed fairly straight forward. I mean, GMO's are evil right, so this should be a cinch. Right? Turns out things aren't just black and white in this world. Who would've guessed? I've also begun to realize how many people want it to look that way. The articles that introduced me to this issue were all passionately anti-GMO, and leave you shaking your first at The Man and his Evil Laboratory! They raised legitimate questions and concerns, and I thought I had this project in the bag. I even checked out the oppositions's website, and felt my blood pressure skyrocket as I read their brazen claims of apple superiority and desirability. I looked that website squarely in the eye and said, "We'll see about that". I had my list of arguments, and the GMO stood no chance. The uncomfortable thing about controversial issues is that if they could be all neatly wrapped up and decided one way or the other they wouldn't be issues. As much as I would like to believe (at least for the sake of my project) that the only reason this GMO has gotten as far down the road as it has is Evil Government Conspiracy, the truth is that it has it's own legitimate arguments. And some of them are very convincing. And my own arguments are starting to look a little sad in comparison. Maybe not a shocking revelation to most, but I'm finding myself surprised by a lot of strangely simple things lately. Its one of the things I've really enjoyed about being at university this year. It challenges me to step outside my usual sphere of safe and "correct" thoughts, and take a closer look at things that I would regularly take for granted. For the record, I still don't support GMO, but dangnabit, those guys have good marketing and PR staff! Your mom told me about your prof and I never had that guy, although when I met him, he seemed... interesting. If you ever take a Philosophy class again try and get Bruce, Jenna or Robin. They're all fabulous. Logic can be very dry. If you don't like it, don't let it turn you off Philosophy in general. But the skills you'll learn in that class will help you in all the other classes - even in other subjects. Unfortunately, choosing a topic you feel strongly about might hurt your grade and your learning experience because passion and emotion will blind you to the way logic is supposed to work. You're better off choosing a topic that you're indifferent to because the process of doing your project will be a lot easier to handle emotionally and scholoastically, and you'll be less prone to make logical mistakes and therefore get a better mark. And I don't support GMO either, dangnabit! Marketing turds. @D, I think you absolutely right about emotion blinding real logic...but I also think that is why this is a great project for me. It has forced me to give up the emotional side of the argument, and look at the facts, which has allowed me to better understand the opposing argument. Emotions themselves won't stand up to the scrutiny required in this assignment. Can't wait to read your paper. And now I'm going to raid the fridge for an apple..the power of suggestion at work!